Organize with Tags – Learn Picasa and Google Photos! 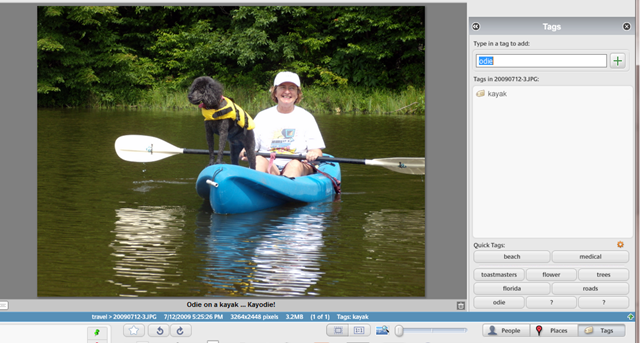 The following tip is excerpted from the Beginner’s Guide to Picasa. Tags are a way to add some identifying words to a photo without using the filename or the caption, and without putting them in a special folder or album. For example, I take a lot of scenic pictures and I may sometime have a need to find the best picture of a beach or a mountain. I can use Tags for this. One given picture can have many tags, and this will make the picture searchable by any of the words used in the tags. It is recommended to use single word tags. To add a tag to a picture, select one or more pictures and click on the Tags button in the lower right. You should see a new Pane open on the right side of your Library. You can type a new tag in the space provided at the top,and press the + button to add the tag to the selected picture(s) or you can choose one of the quick tags. If you spend a few minutes adding tags to photos whenever you import new pictures, you will love yourself later when you can search for anything your heart desires. I received E-Mails containing photos which I save to E-Mail folders. I have tried to have Picasa find these E-Mails but to no avail. Help? I see the dog has a life preserver on but where is yours?? Enjoy your website and don’t want anything bad to happen to you.